I raised my hand and said that they can do so if they advertise. 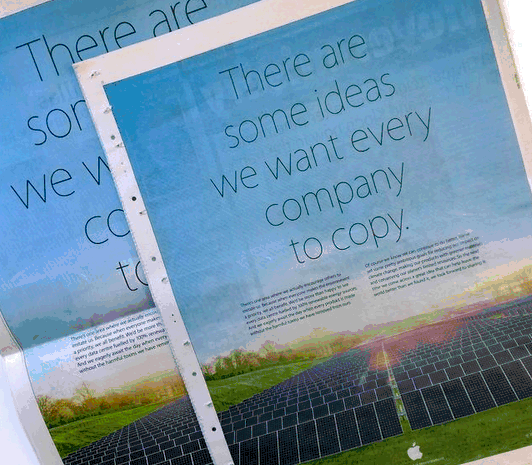 I mentioned the full page ad by Apple showing a field full of solar panels poking fun at Samsung, but I did not make a very good argument in the follow-up. Someone else in class with a strong background in logistics mentioned that alternatives to diesel at this point in time will not justify the transition. 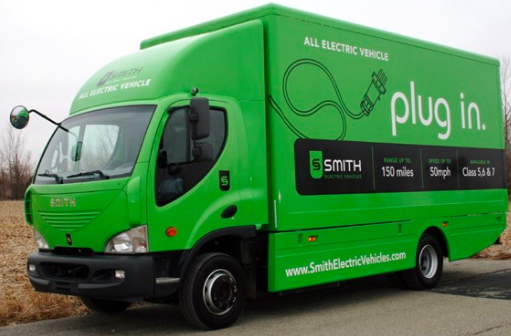 Early adopters of electric powered batteries for their fleet can even be penalized by the introduction of superior new technology at a later date. A lot of the companies are waiting for a technological breakthrough before jumping in the bandwagon. I lived with an Art Director (marketing) for about half a year and I still stand by my answer. In the global economy and with the advent of social media marketing, companies that choose to go green, COMBINED with consumer awareness of their efforts WILL gain a competitive advantage. Perhaps failed green initiatives lacked an alignment of supply chain initiatives with marketing and sales. I know it is a sad proposition… to think that a good deed in the business world can only show bottom line rewards if you spend money to tell the world you are doing it. Nevertheless, I think it is true. Out of the millions of people that watched this, how many actually went out and purchased a Volvo Truck just like that in the ad BECAUSE they watched the video? My guess is five or six. The companies that can afford to buy that truck received brochures and closed contracts months before it went into production. They didn’t buy the truck because of the video. That video wasn’t even made for them. It was made for the internet to go viral. It did. The video above was watched 78 million times and counting. From a marketing standpoint it was a tremendous success. It made people laugh, reach out, share and connect. It spread like a virus throughout social media outlets. People who can’t even drive hash tagged “Volvo” and “Epic”. 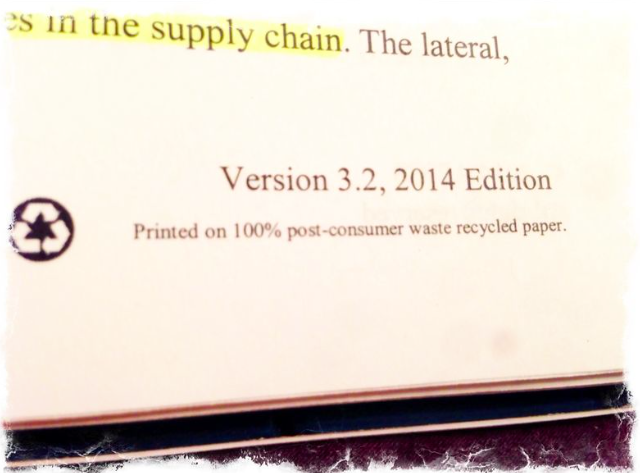 Going back to green supply chain management. 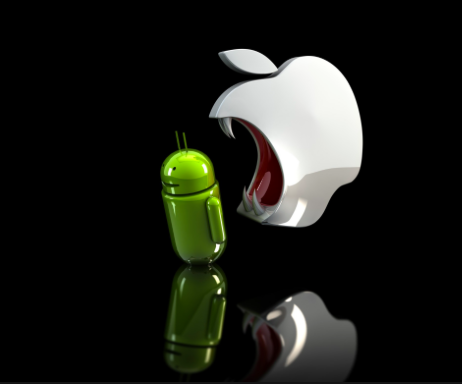 One day after my class here in Toronto, Canada… someone on the other side of the planet sent me a group text commenting on the Apple VS Android war. Before I could even join the conversation, someone had already linked the Apple /Environment page. Green efforts get people talking. There is a cost involved when you put the environment into the equation, but as more and more companies join the fray it will be more costly NOT to join. Transitioning briefly to the social aspect of the triple bottom line, you can think about the implications felt in the garment industry all over the world after the factory collapse in Bangladesh, one year ago on April 24th, 2014. I will revisit the social component sometime next week. The company I work for is organizing a fund raiser to help a Canadian charity organized by the Bank of Montreal: Kids Help Phone. Another advantage to social and environmental efforts can be achieved through tax breaks. Once again require corporate alignment is required. That is printed at the bottom of every page. Over one thousand times. Going green is the FUTURE. It’s just not for everyone YET. towards high efficiency should be planed promptly.